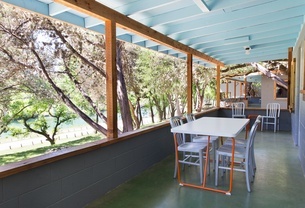 The Reunion Cabin is located on the grounds of the Wimberley Log Cabins Resort and Suites situated just a couple of minutes from the downtown square and across the street from the Wimberley Market Day's pavilion. The Reunion Cabin is a newly renovated beauty located at the rear of the property closest to the pool. It features 2 bedrooms/2 bathrooms and has a commercial style kitchen and meeting space seating up to 40 people. The first time you drive up the cool stone driveway of this beautiful vacation retreat, you will be unsure of what to appreciate first: the beautiful serenity of the sun streaming through the large oak trees. The 600+ feet of gorgeous river frontage just a short three minute walk from the house, there is also a paved road down to the river if you prefer to drive. Beautiful Cypress trees in abundance between the property and the Blanco River. A Loft to Remember These brand new lofts will be something to write home about... With two master queen bedrooms, a large loft with 2 semi-private queen rooms AND a double bunk room, there will be space for everyone. They are two stories, a short distance from the pool, have a stellar river view and will sleep up to 12 guests. Downstairs you will find the main living area complete with a TV, two private master bedrooms, a spacious kitchen WITH a dishwasher and a double-vanity bathroom. Upstairs, you have another TV area and two queen beds in a semi private loft overlooking the downstairs living room. The kiddos (or kids at heart!) will find their room complete with 2 sets of twin bunk beds. And, no need to wait in line, there's an additional double-vanity full bathroom upstairs. 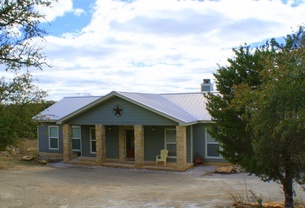 Roadrunner Ridge is the perfect Hill Country Getaway location for anyone looking for a peaceful and secluded home full of rustic charm but updated amenities. This three bedroom, two bathroom gem can sleep eight comfortably and has a prime location for any Hill Country outings you have in mind. Just minutes from downtown Wimberley, San Marcos, Canyon Lake, or even New Braunfels, whatever the reason for your stay, Roadrunner Ridge is close to it all. 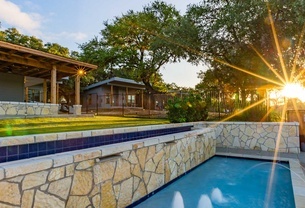 If Hill Country Views is what you are after, look no further than Buena Vista – a vacation home in Canyon Lake, that was named for its 360 degree “Beautiful View”. 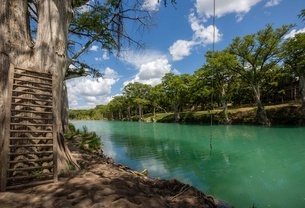 The home is near local music venues including Gruene Hall and White Water Amphitheater as well as the Guadalupe and Comal Rivers, Canyon Lake and Schlitterbahn. This home rests between Wimberley and Canyon Lake, and near San Marcos, New Braunfels and Gruene with tons of shopping, dining, outdoor activities and fun. 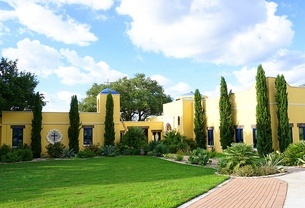 Experience Wimberley from one of the most popular locations in this quaint town! Located directly across the street from the historic 7A Resort and Pioneer Town, guests of Green Acres can enjoy the amenities of this fantastic property that are open to the public (admission fees may apply) with the easiest of access. Enjoy the evening breezes from the wraparound porch or sip your morning coffee while watching the local wildlife roam. Indoors you have enough space to spread out as well. 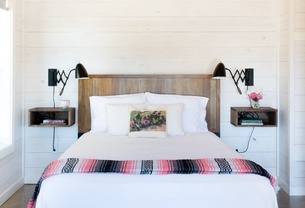 The light and airy feel of the décor adds to the feeling of relaxation that Wimberley is famous for. The open kitchen and living area are a natural gathering point. The three bedrooms are spacious and comfortable and there is even room for more with the sofa sleepers! The Wimberley Log Cabins Resort and Suites is perfectly located directly across the street from the popular Market Days location, and minutes from the downtown square. Unit three, located in the front building, boasts a king sized bed, a roomy living area with a queen sized sofa sleeper, a full bath, and a small kitchenette. The Wimberley Log Cabins Resort and Suites is perfectly located directly across the street from the popular Market Days location, and minutes from the downtown square. Unit four, located in the front building, boasts a king sized bed, a roomy living area with a queen sized sofa sleeper, a full bath, and a small kitchenette.